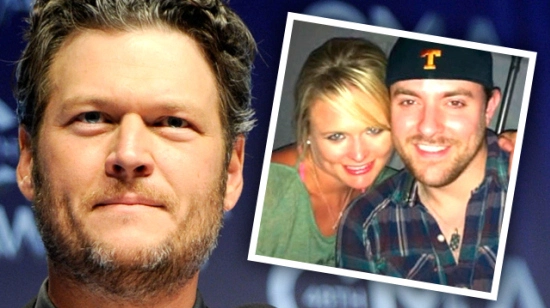 Country singer Chris Young denies rumors of having an affair with his tour mate Miranda Lambert. Chris Young says he did NOT have an affair with Miranda Lambert, despite claims he “hooked up” with the country superstar while she was married to Blake Shelton. Young and Lambert have been friends since at least 2010 and toured together in 2012, with the performer serving as her opening act. They’ve remained somewhat close (see photo from 2013 at right), and were last seen together in February. Lambert and Shelton announced their divorce on Monday, and on Tuesday, TMZ alleged Young played a role in the split. The site, which broke the news of the divorce, claimed Shelton “heard rumors Miranda had hooked up with [Young] and thought it was believable enough to make him suspicious of her.” TMZ clarified, however, that Young “was NOT the catalyst for the divorce,” but that Shelton had received information that Lambert had been unfaithful with someone else, too, leading him to file two weeks ago. A judge signed off on the divorce on Monday, as Gossip Cop noted, but it’s not known if Shelton claimed adultery or irreconcilable differences. Shelton and Lambert have not addressed the cheating speculation. As Gossip Cop previously reported, they released a joint statement on Monday saying, in part, “This is not the future we envisioned. And it is with heavy hearts that we move forward separately.” TELL US: What do you think of Young issuing a denial?